Goat hike and collection of food. 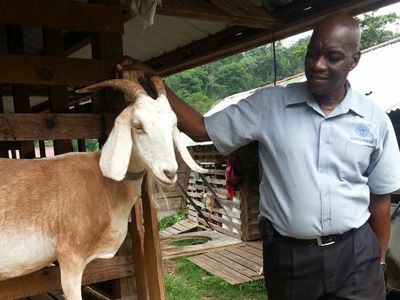 Caribbean Horizon guide and goat enthusiast Denny. We have a job too! Males! 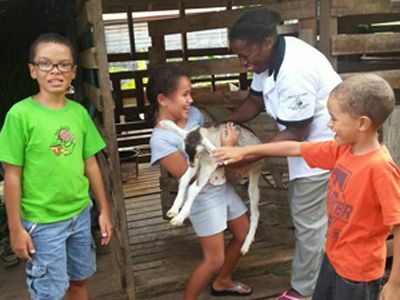 Caribbean Horizons partners with the Goat Project at Belmont estate to design a tour geared to interest families on holiday in Grenada. 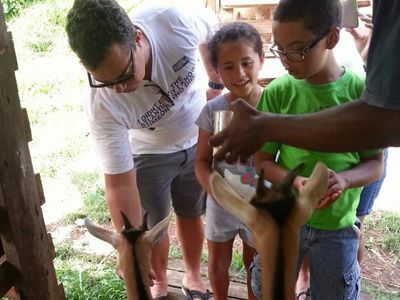 Children and other family members get to visit the habitat of the endangered and endemic Grenada Dove and have an introduction to birdwatching while observing migrant birds at a viewing platform; then they visit a petting zoo and can interact with a variety of native animals, including the 9 banded Armadillo, Mona Monkey, Iguanas etc…. The highlight of the tour is the introduction to goat hearding and tasting of chocolate desert. Meals with kids in mind are available too! Last stop is Grand Etang lake to feed the fish… giant coy have joined the schools! This is a full day tour, but we can tailor the time and customize the location to suit your groups preferences.